It's finally here! Today is the second annual Diamondbacks Alumni Game. I had a good time at the first one last year so I've been looking forward to this for awhile. You may remember I was able to get a few alumni autographs last year. I realized that I never posted this one from former D-Backs reliever, Vladimir Nunez. 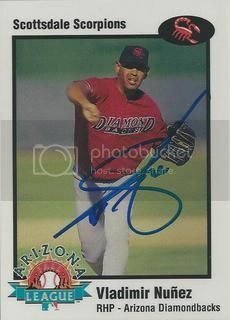 Vladimir signed his card from the 1998 Arizona Fall League set for us. I got this card at the first Fall League game that I ever attended. My dad saw in the newspaper where they were having an appearance by Hall of Famer Brooks Robinson. He was one of my dad's favorite players so we went to check it out. We each were able to get an autograph from Brooks. I bought the team set and got a few cards signed from the players who were there. After being a top D-Backs prospect, Vladimir only spent a short time with the big club before being traded to the Marlins. He pitches just over 39 innings and struck out 30 batters. A few months ago I signed up for a monthly subscription box service called Loot Crate. 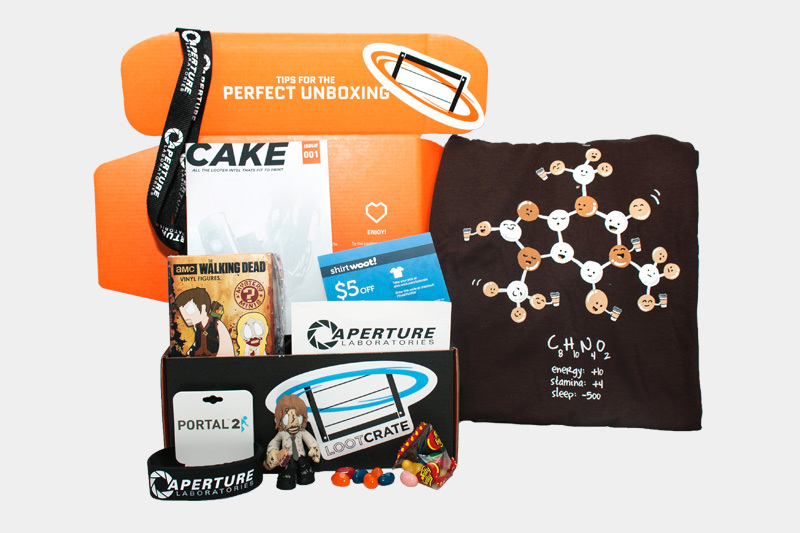 Basically for less than $20 a month they'll send you a box of random, nerd stuff. I've gotten four so far and it's a lot of fun. I've gotten some cool stuff like a vinyl zombie figurine from The Walking Dead, a pair of Yoda ear buds, a few t-shirts and a pair of 8-bit sunglasses. I'm not sure if anyone else out there in the blogosphere likes this kind of stuff but I thought it's pretty rad. If you're interested in signing up use this link. You'll save a few bucks, I'll save a few bucks and everybody will be happy. Diamondbacks prospect, David Holmberg, is making his MLB debut tonight against the Padres. Jonathan Mayo has him ranked as the fifth best prospect in the organization. Fangraphs had a nice write up about him today. You can read it here. He's put some good numbers at Double A this year and projects as a number 3 or 4 starter at best. 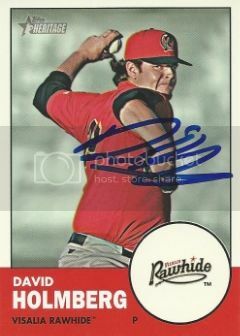 David signed his card from the 2012 Topps Heritage Minor League set for us this past February during Spring Training. Yesterday I met up with Daniel from It's Like Having My Own Card Shop to get autographs from Shea Hillenbrand and Augie Ojeda at an event promoting the second annual Diamondbacks alumni game. The alumni game will take place next Saturday at Chase Field after the D-Backs play the Giants. 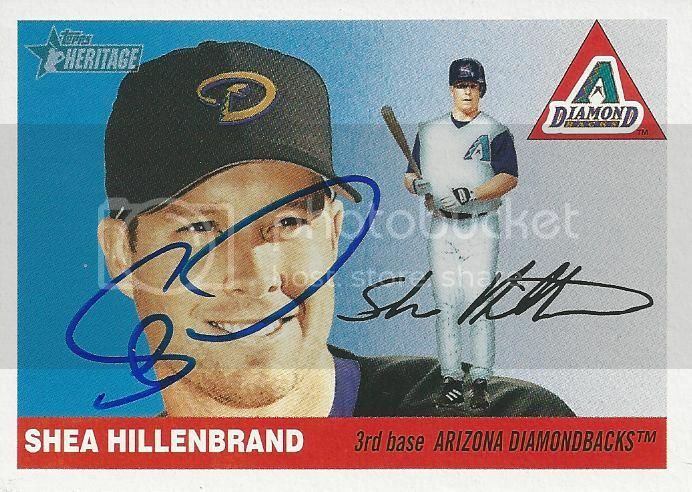 Shea Hillenbrand signed his 2004 Topps Heritage card for me. Shea was a two-time All-Star during his career. Neither appearance came while he played in Arizona but he did pretty well out here. He hit .294 with 32 home runs and 139 runs batted in over 233 games for the D-Backs. Yesterday afternoon I headed over to the Game Seven Grill for the Diamondbacks viewing party. The highlight was an appearance by D-Backs alumni, Albie Lopez and Augie Ojeda. Augie Ojeda spent parts of four seasons with the D-Backs. He hit .243 and drove in 50 runs in 687 at bats. 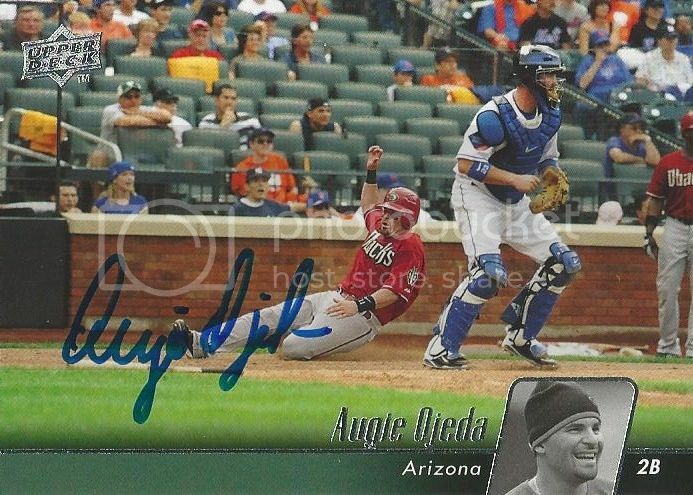 Augie signed his 2010 Upper Deck card for us. It turned out great. This afternoon I headed over to the Game Seven Grill for the Diamondbacks viewing party. If you're not familiar with Chase Field, there's a restaurant located right on the main concourse. It's gone through a few names and renovations since it first opened. This past April it reopened as the Game Seven Grill. This is the first viewing party that the D-Backs have ever had there. It was really cool and I hope they do it again. They had some cool giveaways and a few freebies. I didn't win anything but that's okay. That's not why I was there. The highlight of the viewing party was an appearance by D-Backs alumni, Albie Lopez and Augie Ojeda. 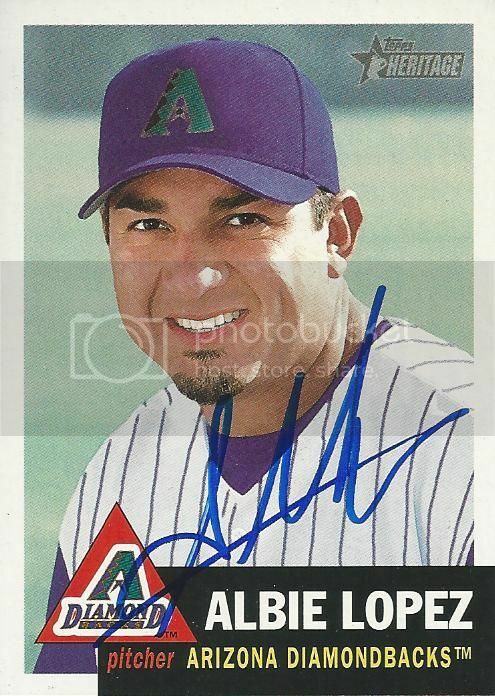 Former D-Backs starting pitcher, Albie Lopez, signed his 2002 Topps Heritage card for me. Albie only played in Arizona for a short time but he had a big impact. He joined the D-Backs in July of 2001 just in time to help with their playoff run. Albie won four games one of which was a complete game to help clinch the division. Diamondbacks prospect, Matt Davidson made his MLB debut over the weekend. You may remember him from being named MVP of the 2013 Future's Game. Matt is currently listed at number two on Jonathan Mayo's list of top D-Backs prospects. We have high hopes that he'll be something special and hold down third base for a long time. 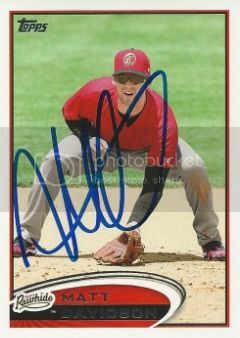 Matt signed his 2012 Topps Pro Debut card for us during Spring Training. 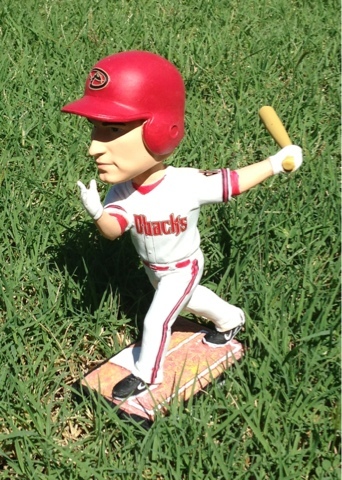 Yesterday was Paul Goldschmidt bobblehead day at Chase Field. My wife and I conquered the crowds and brought this little guy home. The game itself was just okay. The D-Backs lost to the Mets 4-1. It seems like we lose every time I'm in attendance this year. I'll be back out there in three weeks for Throwback Night and the second annual Alumni Game. Hopefully we'll still have a chance at making the playoffs then.